As the executive chef-in-residence at one of the country's leading cancer wellness centres, Rebecca Katz knows that cancer patients and their caretakers want science-based recipes that are tasty, healthy, and easy to prepare. This book features whole-foods and big-flavour recipes designed to ease symptoms along with customized menu plans specially formulated for all treatment phases, cancer types, side effects, and flavour preferences. 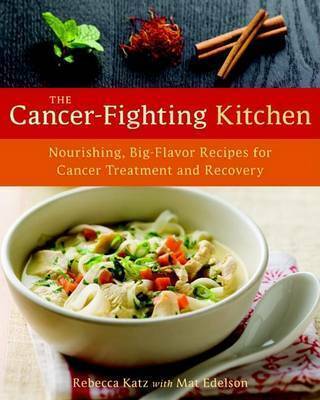 "The Cancer-Fighting Kitchen" includes full nutritional analysis for each recipe and notes that teach readers how to build a culinary cancer-fighting pharmacy. "Praise for One Bite at a Time": 'How wonderful that people with a cancer diagnosis...have a fabulous new resource that will invigorate the taste buds that chemotherapy and radiation often take away. In addition to being a practical guide for how to buy and prepare nourishing and necessary foods, this is a book to savour and treasure, for the words and wisdom found within its pages give a much needed boost to the mind, body, and spirit' - Ellen Stovall, president and CEO of the National Coalition for Cancer Survivorship. As the senior chef-in-residence and nutritional educator at one of the country s leading cancer wellness centers, REBECCA KATZ, MS, is the culinary link bringing together physicians and patients with a common goal: eating well to maximize cancer treatments, minimize side effects, and improve outcomes. She is the founder of the Inner Cook, a Bay Area culinary practice that specializes in meeting the specific nutritional and appetite needs of cancer patients, and a senior chef at Commonweal Cancer Help Program in Marin County, California. Katz has been a guest chef and lecturer at top academic medical centers throughout the country, including the annual Food As Medicine conference. Visit www.rebeccakatz.com for more information. MAT EDELSON is an award-winning medical, science, and sports journalist and the former director of the Johns Hopkins Health News Minute, a nationally syndicated consumer health radio feature. He lives in Baltimore, Maryland."